Heel Pressure Injury Relieving Devices Market : Segmentation By Product Type - constant low pressure devices and alternating pressure devices; By End User- hospitals, acute ambulatory care and specialized care units. A recent market study published by the company – “Heel Pressure Injury Relieving Devices Market: Global Industry Analysis 2013 – 2017 and Forecast 2018 – 2026” consists a comprehensive assessment of the most important market dynamics. On conducting a thorough research on the historic as well as current growth parameters of the Heel Pressure Injury Relieving Devices market, growth prospects of the market are obtained with maximum precision. The report features unique and salient factors that may make a huge impact on the development of the Heel Pressure Injury Relieving Devices market during the forecast period. It can help market players to modify their manufacturing and marketing strategies to envisage maximum growth in the Heel Pressure Injury Relieving Devices market in the upcoming years. The report provides detailed information about the current and future growth prospects of the Heel Pressure Injury Relieving Devices market in the most comprehensive way for the better understanding of readers. The report commences with the executive summary of the Heel Pressure Injury Relieving Devices market report, which includes the summary of key findings and key statistics of the market. It also includes the market value (US$ million) estimates of the leading segments of the Heel Pressure Injury Relieving Devices market. Readers can find detailed taxonomy and the definition of the Heel Pressure Injury Relieving Devices market in this chapter, which helps readers to understand the basic information about the Heel Pressure Injury Relieving Devices market dynamics, supply chain, cost structure, pricing analysis, list of key distributor and suppliers, list of key market participants included in the report. Based on the product type, the Heel Pressure Injury Relieving Devices market is segmented into constant low pressure devices and alternating pressure devices. In this chapter, readers can find information about key trends and developments in the Heel Pressure Injury Relieving Devices market and market attractive analysis based on the product type. In this chapter, readers can find information about key trends and developments in the Heel Pressure Injury Relieving Devices market and market attractive analysis based on the product type for each region. Based on the End User, the Heel Pressure Injury Relieving Devices market is segmented into hospitals, acute ambulatory care and specialized care units. In this chapter, readers can find information about key trends and developments in the heel pressure injury relieving devices market and market attractive analysis based on End User. In this chapter, readers can find information about key trends and developments in the heel pressure injury relieving devices market and market attractive analysis based on the End User for each region. This chapter explains how the heel pressure injury relieving devices market will grow across various geographic regions, such as North America, Latin America, Europe, Asia Pacific and Middle East & Africa (MEA). This chapter includes detailed analysis of the growth of the North America heel pressure injury relieving devices market along with the country-wise assessment including the U.S. and Canada. Readers can also find regional trends, regulations, and market growth based on product type, application, end user and country of Heel Pressure Injury Relieving Devices in the North American region. Readers can find detailed information about factors such as, pricing analysis, and regional trends that are impacting the growth of the Latin America heel pressure injury relieving devices market. This chapter also includes the growth prospects of the heel pressure injury relieving devices market in leading LATAM countries such as Brazil, Mexico, Argentina, and rest of the Latin America region. Important growth prospects of the heel pressure injury relieving devices market based on its product types, and applications in several countries, such as Germany, UK, France, Spain, Italy, Russia and Rest of Europe is included in this chapter. China, India, Japan, Australia, South Korea, ASEAN 5 and Rest of Asia-Pacific are the leading countries in the Asia-Pacific region that are the prime subject of assessment to obtain growth prospects of heel pressure injury relieving devices market in this chapter. Readers can find thorough information about the growth parameters of the Asia-Pacific heel pressure injury relieving devices market during the period 2018-2026. This chapter provides information on how the heel pressure injury relieving devices market will grow in the major countries in MEA region, such as GCC Countries, Israel, South Africa and Rest of MEA, during the period 2018-2026. In this chapter, readers can find a comprehensive list of all the leading stakeholders in the heel pressure injury relieving devices market along with detailed information about each company, including company overview, revenue shares, strategic overview, and recent company developments. Market players featured in the report include Stryker Corporation, EHOB, DeRoyal Industries, Inc., Mölnlycke Health Care AB, DermaSaverPro, Owens & Minor, Inc., Skil-Care Corporation, Posey Products, LLC, Maxxcare B.V. and Medline among others. This chapter helps readers to understand the research methodology followed to obtain various conclusions, important qualitative information, and quantitative information about the Heel Pressure Injury Relieving Devices market. The heel pressure injury relieving devices market is highly fragmented due to presence of a lot of small and medium sized regional players. Still some manufacturers who have comparatively higher reach in the regions such as North America, Europe and to some extent in the Asia-Pacific are Stryker Corporation, EHOB and DeRoyal Industries, Inc. These manufacturers are comparatively major players in the heel pressure injury relieving devices market. The e-commerce platform is used for the greater benefit by these manufacturers by offering their products at reasonable price. Fragmented nature of the heel pressure injury relieving devices market indicates presence of significant number of regional players. The prices of heel pressure injury relieving devices varies to significant extent with respect to the region. Various regional players in heel pressure injury relieving devices offer economical product in the Asia-Pacific region. Posey Products, LLC which is family owned business offers heel pressure injury relieving devices in Australia at economical price as compared to comparatively bigger players. The reimbursement for the hospital acquired pressure injuries was discontinued by the center for the Medicare and Medicaid services in 2008. Despite the increased awareness each pressure ulcer treatment causes around US$ 70,000 to US$ 150,000 per ulcer. Heel pressure injury relieving devices offer patient specific and site specific approach for the prevention of the pressure injuries which helps to gain higher traction among the healthcare facilities. Whereas, most of the countries in regions such as Asia-Pacific, Latin America and Middle East and Africa do not strict regulations about usage heel pressure injury relieving devices for prevention of pressure ulcers. The strict reimbursement scenario has forced healthcare facilities to prevent pressure ulcers which in turn contributing to heel pressure injury relieving devices market. Various organizations in the heel pressure injury relieving devices market across different regions have put up the guidelines for the prevention of the pressure ulcers due to significant amount of treatment for the treatment of pressure ulcers. The National Pressure Ulcer Advisory Panel (NPUAP) in the US has provided guideline for the prevention of pressure ulcer. The guideline provided is based on the stage of the pressure ulcer like stage 1 or stage 2 and so on. Similar organizations in the Europe and Asia-Pacific are focusing on minimizing the incidence of pressure ulcers and enhancing heel pressure injury relieving devices market growth. These guideline recommends healthcare professionals about preventive measures to be taken such as heel pressure injury relieving devices. As per NPUAP, in the US each year around 60,000 people dies due to pressure ulcers this has led to greater acquaintance by the healthcare professionals in the developed regions. The adoption of the heel pressure injury relieving devices for the prevention or treatment is still low in the regions such as Asia-Pacific, Latin America and MEA. Despite of the moderate to high prevalence in these regions lack of regional players few years ago led to low penetration of heel pressure injury relieving devices in the region. Whereas, rapidly evolving market with local players offering economical heel pressure injury relieving devices it is expected to experience steady growth over the forecast period with increasing adoption. 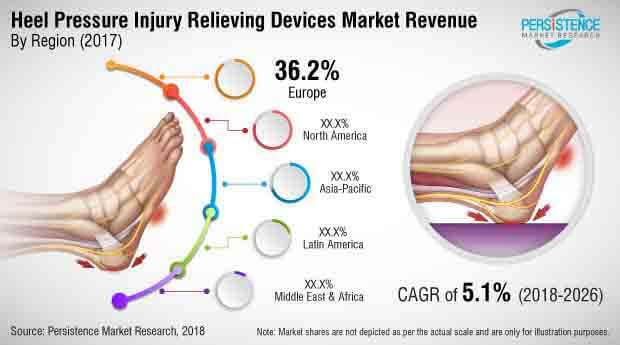 Competition section of the heel pressure injury relieving devices market features profiles of key players operating in the industry based on their market shares, differential strategies, product offerings, marketing approach and company dashboard. Some of the key players featured in this report include Stryker Corporation, EHOB, DeRoyal Industries, Inc., Mölnlycke Health Care AB, DermaSaverPro, Owens & Minor, Inc., Skil-Care Corporation, Posey Products, LLC, Maxxcare B.V. and Medline among others. Stryker Corporation offers a range of products in heel pressure injury relieving devices which include prevalon, heel protector OR (constant low heel pressure injury relieving devices) and range of alternating heel pressure injury relieving devices which include mattresses. The manufacturers are focusing on developing economical and technologically advanced heel pressure injury relieving devices. The report offers a comprehensive taxonomy of heel pressure injury relieving devices market based on product type, end user and region. The heel pressure injury relieving devices market based on the product type is segmented into constant low heel pressure injury relieving devices and alternating heel pressure injury relieving devices. The constant low heel pressure injury relieving devices offers variety of different products in it, such as gel based foot protector, foam based foot protector, air-filled foot protector, heel cups and others. Others in the heel pressure injury relieving devices contains pillows, round heel elevator, etc. Whereas inflating and deflating nature of the alternating heel pressure injury relieving devices provides greater effectivity in patient who cannot move e.g. after surgery or geriatric patients. End-use segments in heel pressure injury relieving devices market which are a part of this heel pressure injury relieving devices market report include hospitals, Acute Ambulatory Care and Specialized Care Units. The heel pressure injury relieving devices market has been analyzed across regions of North America, Latin America, Europe, Asia Pacific and Middle East & Africa (MEA). What is the global revenue potential of heel pressure injury relieving devices? Who are the key competitors and what are their portfolios in heel pressure injury relieving devices market? What are major challenges influencing the growth of heel pressure injury relieving devices market? How the discontinuation of Medicaid and Medicare services for pressure ulcer affected the heel pressure injury relieving devices market? The heel pressure injury relieving devices market has been estimated based on supply-demand approach. The market was first calculated based on procedures volume conducted in different region/countries using heel pressure injury relieving devices. Other qualitative factors analyzed during test volume estimation include awareness level for heel pressure injury relieving devices and availability of heel pressure injury relieving devices. This information is further validated with rigorous primary research (including interviews, surveys, in-person interactions, and viewpoints of seasoned analysts) and secondary research (including verified paid sources, authentic trade journals, and resourceful databases). The research study on heel pressure injury relieving devices market also includes top trends and macro as well as micro economic factors shaping the heel pressure injury relieving devices market. With this approach, the report on heel pressure injury relieving devices market anticipates the industry attractiveness of every major segment in heel pressure injury relieving devices over the forecast period.